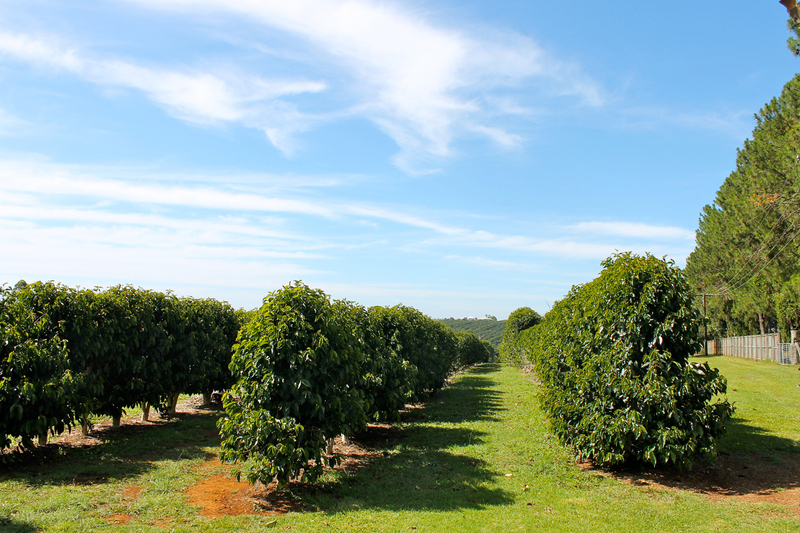 Davidsonia pruriens is a small slender tree native to Australia and Northeastern Queensland. 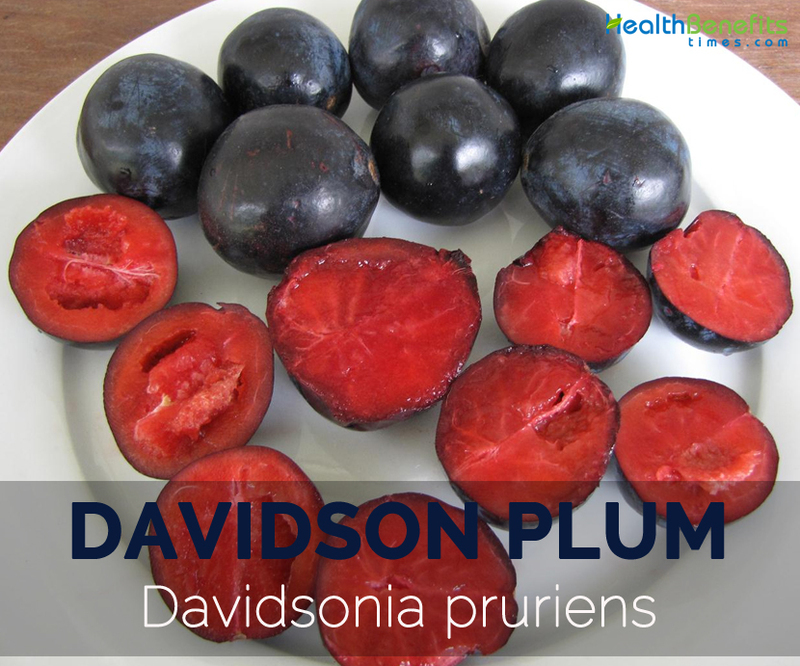 Common names include Davidson plum, Davidsonia Plum, Davidson’s Plum and Queensland Davidson plum. 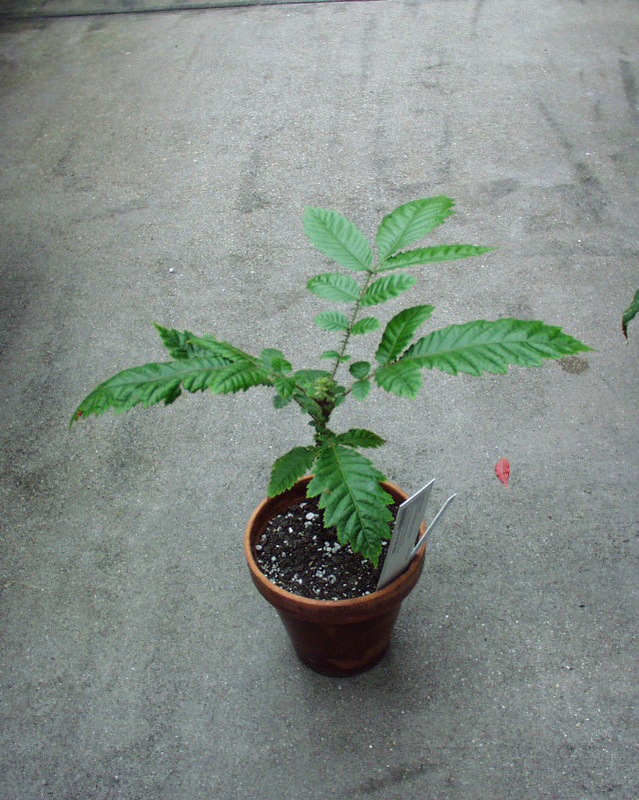 This plant is grown as an ornamental tree for its fruit which is known as Davidson plum. 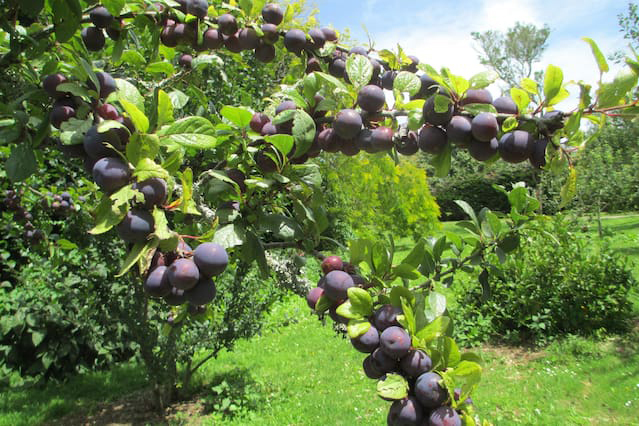 This species bears the sour dark burgundy fruit which is edible and resembles the European plum. The plant of this species reaches up to 12 meters in height which belongs to family Cunoniaceae. The berry has the earthy, tart, intense flavor with sharp acidic taste. 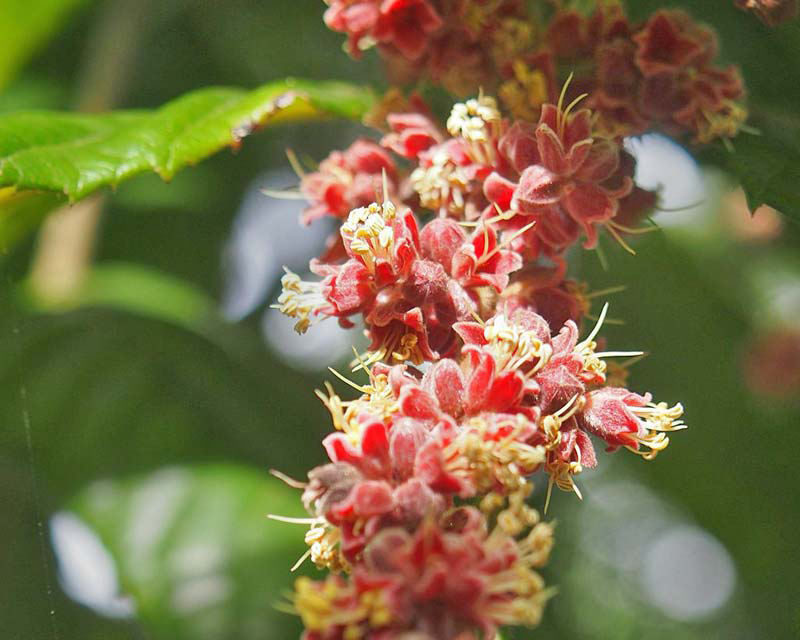 The small, slender, ornamental tree can naturally reach upto 6-12 m high. It has alternately arranged, pinnate, cordate to suborbicular green leaves which is upto 18-35(-46) cm long and (6-)8-12(-16) cm wide. 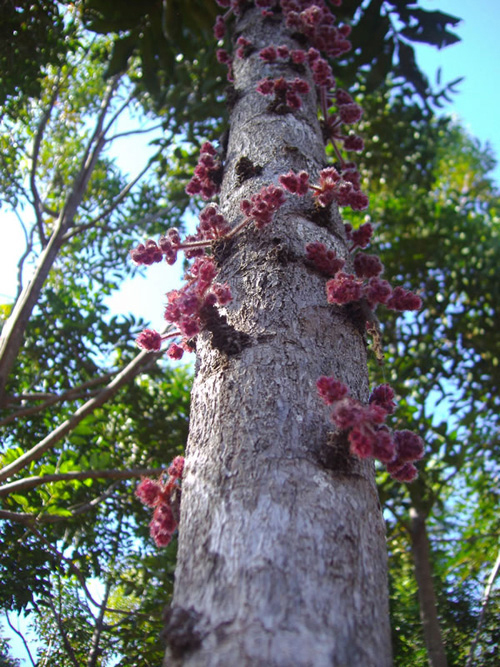 The tree has recurved, dark pink flowers of 5-8 mm long which flowers between November to February and later converts into a fruit. Fruit are dark burgundy drupe (berries), obovoid or ellipsoid, compressed; 3.8–6.0 cm long and 3.0–5.3 cm wide. The fruit’s flesh is usually dark red colored. The bark is brown to dark grey and flaky. 100 grams of raw Davidson plum provides 63 calories, 0.2 grams of total fat, 1 grams of protein, 14.3 grams of carbohydrate, 3.9 grams of total sugars and 10.4 grams of starch. The same amount provides 30 mg of vitamin C, 364 mg of potassium, 27 mg of magnesium, 45 mg of sodium, 18 mg of phosphorus, 16 mg of calcium and 0.17 mg of niacin. Davidson plum has high amount of anthocyanins which is an antioxidant higher in comparison to the blueberry. It promotes the overall health and prevents diseases. The intake of Davidson plum in small amounts also provides identical benefits. 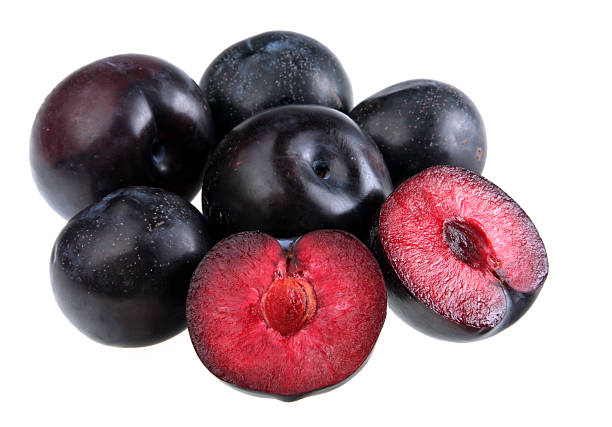 The plum is an excellent source of potassium, Vitamin E, lutein, zinc, folate, calcium and magnesium. Potassium is vital for the heartbeat, movement of muscles, nerves and kidney functions. Zinc and Vitamin E is needed for the youthful and glowing skin. The content of Lutein is more in comparison to avocado which assists to maintain the eye health. 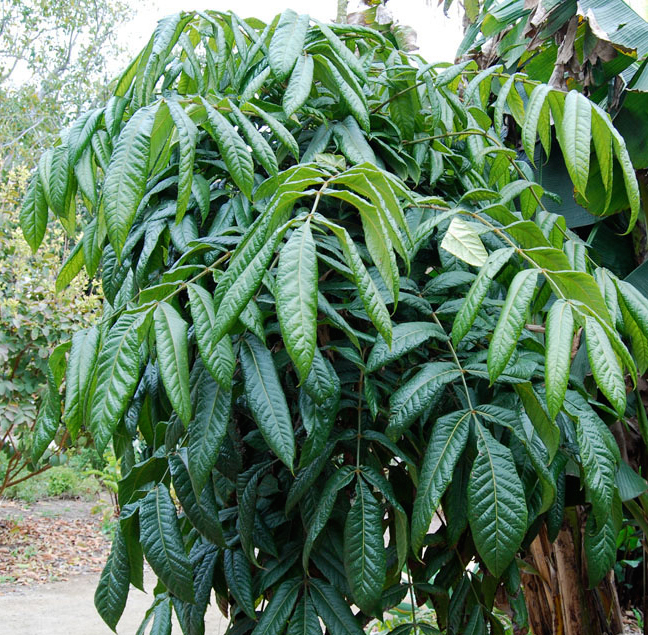 It also possesses antidiabetic properties and has the ability to lower obesity and hypertension. The study shows that high intake of Vitamin C helps to reduce the appearance of wrinkles, skin dryness and also slows down the aging process. Vitamin C is essential for the formation of tendons, skin, blood vessels and ligaments. It assists to heal the wound and forms a scar tissue. The evidence shows that the skin cream with Vitamin C reduces the skin redness. The diet rich in antioxidants helps to maintain the skin health and also prevents from the skin cancer. The body should function properly to absorb the nutrients from the food. The digestive system should absorb the nutrients and absorb it in the blood stream. The cells absorb the nutrients and vitamins which are used by the body to lower inflammation and chances of disease. The intake of Vitamin C with iron increases the iron absorption in the children and adults. The high intake of Vitamin C promotes the effects of cancer fighting drugs which is used in chemotherapy. Vitamin C targets the cells which need these nutriments without harming normal cells. The research shows that Vitamin C is a cost effective aid for lung and ovarian cancer. The study shows that the people with high intake of Vitamin C help to reduce the chances of stroke by about 42%. The people who consume more veggies and fruits have high amount of Vitamin C in their blood. So one should increase the intake of veggies and fruits in a day. Vitamin C enhances the immunity power and body’s ability to eradicate the viruses and colds. The intake of 1000 mg helps to counteract the oncoming cold and 4000 mg helps to eliminate the existing cold. The evidence shows that Vitamin C effectively reduces the complications such as lung infections and pneumonia caused due to the colds and flu. Potassium is essential for promoting metabolism because it has a vital role in breaking the carbohydrates in form of glucose and converts into the useable energy. In addition, potassium assists the body to utilize amino acids to make proteins which builds muscle. The athlete’s intake the foods rich in potassium such as banana, potato or orange juice which helps to replace the lost potassium during exercise. Potassium balances the minerals in the body which is essential for the maintenance and growth of bones and muscles. Potassium balances the fluid levels and relaxes muscles. The low amount of potassium leads to the muscle pain, cramps and spasms. It breakdown the carb and protein which the muscles depend on for the repair and energy. The low presence of potassium leads to the fatigue, weight gain and problem in exercise. Potassium is required to prevent the bones from weakness and chances of fractures or breaks. The low amount of potassium is related to the low bicarbonate precursors which help to neutralize acids which are found in the animal proteins. The bones could be weak, porous and demineralized due to the deficiency of potassium. This could raise the chances of fractures and osteoporosis. Potassium performs as electrolyte which helps to balance fluid, water and level of sodium in the digestive tract. The deficiency of potassium leads to constipation, bloating and abdominal pain caused due to the buildup of fluid and imbalance in minerals. 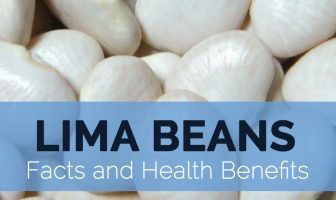 It also helps to balance the acid in stomach, heals gut and maintains the optimal pH level. This helps to eradicate the harmful bacteria which could reduce the immunity. The high intake of potassium helps to reduce the formation of kidney stones. The studies show that the intake of food rich in sodium and low in potassium has the high chances of kidney stones. The low level of potassium is related to high chances of kidney stones because of the inverse relationship between calcium and potassium. In the low presence of potassium, more calcium is excreted through urine which is passed from the kidneys. Kidney stones are the deposits of calcium. The kidney ailments could be reduced by lowering the calcium in urine. The fruit is used to make sauces, jam, wine and cordial. It is used to make sweet and savory dishes such as cakes, sauces, jams, icecream and yogurt. 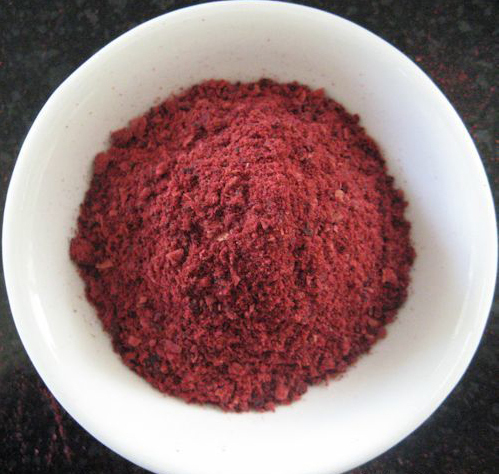 The intense color of Davidson plum is adds a natural colour to foods. The fruit is mostly used in yogurt, dairy foods, sauces, jams, fruit wines and others. It could be used as frozen flesh, frozen puree and dried pulp. It is a great accompany quince, rhubarb and pickles. It could be consumed raw by scattering thin slices along with salt, sugar and chilli powder. It accompany well to meat. 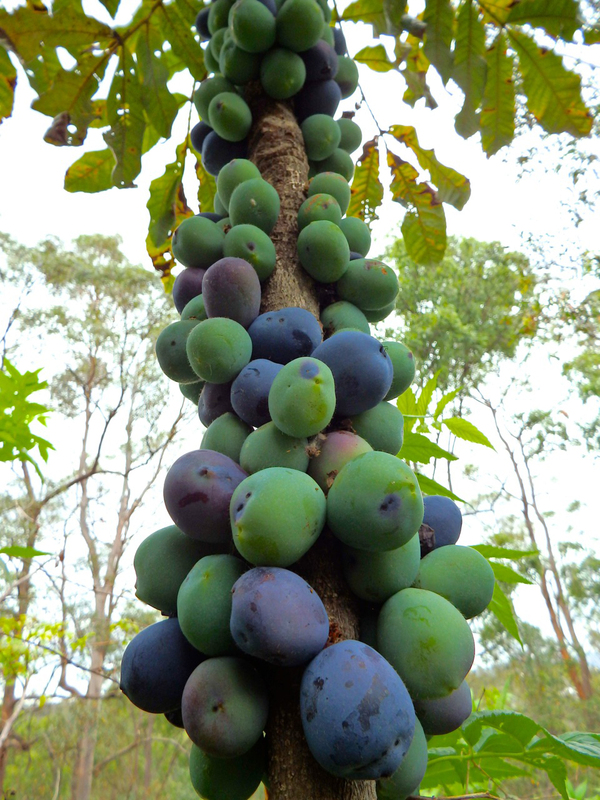 The fruit could be used as sauce along with beef or kangaroo. Calories 63 Kcal. Calories from Fat 1.8 Kcal.